Take stock of your employees’ sense of humor. It’s one of the most vital, valued human resources in your company. When humor is part of your work ethic – from the boardroom down to the front lines – the workplace works even better. Humor increases productivity. Boost your blood flow. Then your workflow. It’s funny how healthy laughter makes you feel. The medical research proves it. A laugh from the belly is good for the soul, not to mention other vital organs. It’s also good for business. Muscles are flexed. Heart rates rise. Blood flow to the brain is increased. Which opens the portals to creative thinking. With all that oxygen and natural endorphins, employees will bring positive energy to work. All in all, a nice way to get the job done. Humorize and humanize. Humor can help break through cubicle walls. Establish common bonds. Fuel creativity. Amplify employee motivation and retention. Communication is invigorated. The connection is strengthened between you, your staff, customers and clients. Humor keeps everyone plugged in to what’s human. FunnyWorks knows the business of humor. It’s in our blood, so we highly endorse the endorphins. Our team members bring diverse experience from the worlds of stand-up comedy, marketing, promotions, advertising, entertainment and more. We’ve worked onstage, behind the scenes and in the corporate trenches. And we’ve found humor everywhere. We happily know how to make it work for you. Humor breaks through barriers. It connects people. It smoothes conversational gears. It can bridge management and staff. Humor in the workplace can even be big business. Ask any successful man or woman. They will tell you that a sense of humor is one of the most powerful and persuasive business tools they’ve got. 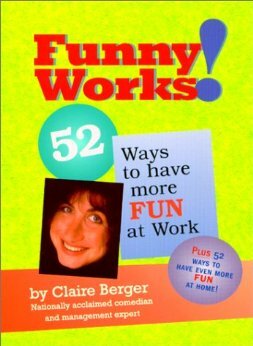 Funny Works gives professionals a way to productively use humor at work. The book gives one crazy, offbeat reason to come to work for every week of the year.